Micro-Star International (MSI) plans to unveil a new all-in-one PC with a 24-inch touchscreen at the Cebit electronics show next week, designed for 3D games or movies such as Avatar. The device, which looks like a stand alone computer monitor and keyboard because the computer is built right into the display, will cost under €2000 (US$2,715) when it launches globally in June, an MSI representative said. The company will offer different choices on hardware components to lower the price of the PC. The large 120Hz LED (light emitting diode) display offers full high definition (HD, 1080p) resolution and comes with shutter glasses for the 3D effect, MSI said. It also includes 10W strong-bass Hi-Fi speakers and a powerful computer onboard with some of the latest Intel Core i7 microprocessors. Flat screen TVs with 3D capability were a big draw at the Consumer Electronics Show in Las Vegas last month, but analysts said the high cost of the TVs, around US$4,000 for some models, as well as the need to wear special glasses to watch them, may hold consumers back from buying this year. MSI will launch several other all-in-one PCs at Cebit under the Wind Top brand, including a few that meet specifications to conform to the E.U. 's Ecodesign directive on EuP (Energy using Product), which is being implemented. MSI's AP1920 19-inch and AE1920 20-inch All-In-One PCs and the Hetis, DC520 and DE220 Mini-PCs all boast average hourly electricity consumption more than 90 percent lower than that of a traditional 300W PC, MSI said. The products also use coating materials that are free of harmful substances and packaging material which is 80 percent recyclable. The company will display a range of other PCs at the show. 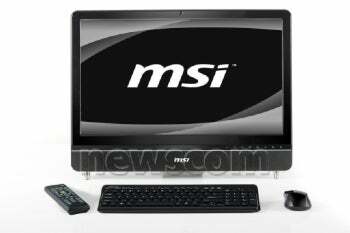 One device MSI is already working on is a new tablet PC to compete with Apple's iPad. MSI representatives declined to provide details but said the tablet may be shown at the Cebit electronics show, which runs March 2 through 6 in Hanover, Germany.